Pictured above: runners and walkers cross the finish line at the 8th Annual run for her® 5K Run & Friendship Walk. What an incredible day! 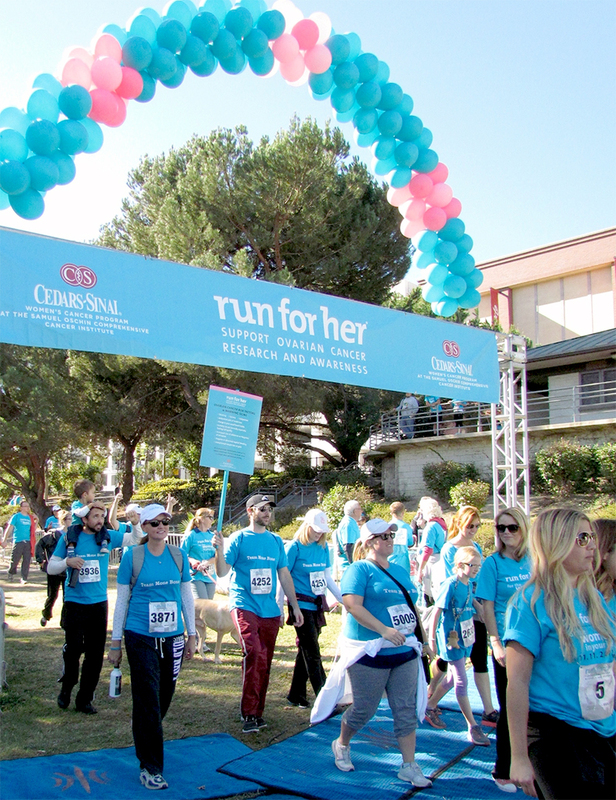 From every perspective, the 8th Annual run for her® was undoubtedly our best yet. 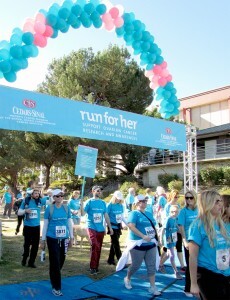 Thanks to you, Cedars-Sinai’s run for her® remains one of the nation’s pre-eminent ovarian cancer awareness events. I am grateful to everyone who helped us reach out to thousands of women all over the world with important information about ovarian cancer. The money you raised will maintain support for our scientists and physicians as they search for keys that can help us find better screening, more effective treatments, and someday a test that will detect ovarian cancer. My heartfelt thanks go out to all of our walkers and runners, all those who donated, our worldwide network of Sleepwalkers, and the hundreds of volunteers who supported the event in Pan Pacific Park. I also want to acknowledge the incredible efforts of our run for her® Committee, the Young Guns and the Sargent Family, as well as our outstanding Community Relations team under the direction of Laura Fuhrman. Every stride we take toward these goals we take together with you. Finally, I want to acknowledge our sponsors – including DFS Galleria, Pacific Sales and LG, G2 Graphics and 7-Eleven, and the many other companies whose support allows us to produce the event. 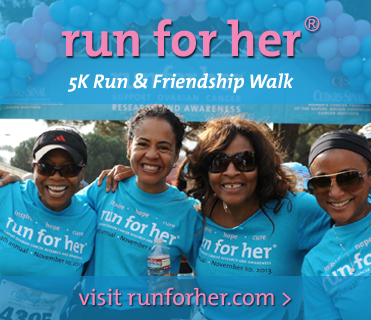 You are all an important part of our run for her® family. The energy in the Park this year was magical. I hope that you will keep the spirit ofrun for her® alive in the weeks and months to come. From the entire Women’s Cancer Program family, best wishes for a safe and happy holiday season.